Issued at 3:41 pm Saturday, 25 October 2008. 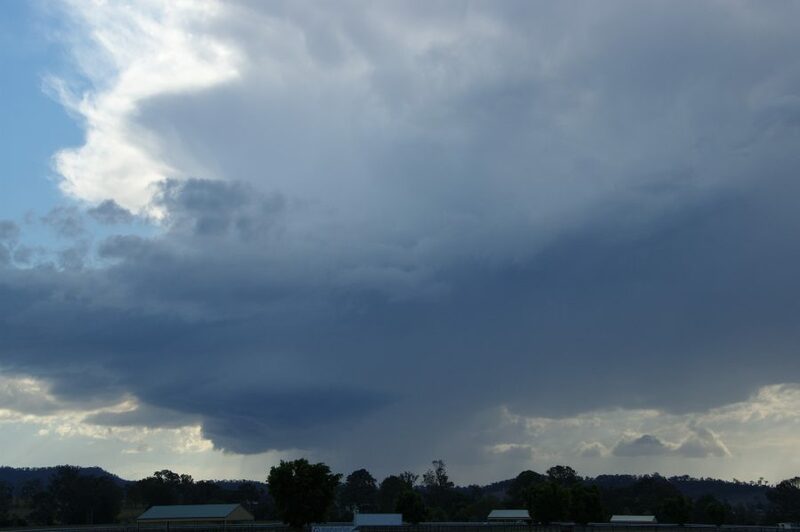 The Bureau of Meteorology warns that, at 3:40 pm, severe thunderstorms were detected on weather radar near Dayboro and waters off Bribie Island. These thunderstorms are moving towards the north. 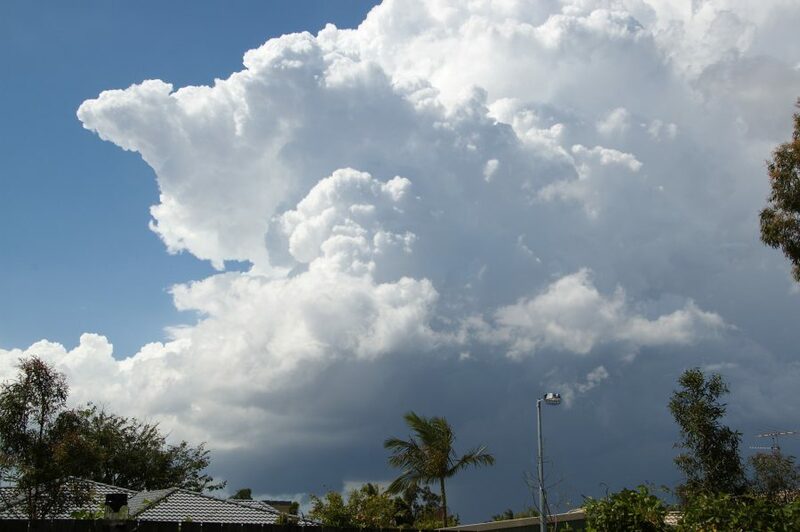 They are forecast to affect Mount Mee, Wamuran and northern Bribie Island by 4:10 pm and Caloundra, waters off Caloundra and Crohamhurst by 4:40 pm. The cell up near Fraser Island also looks quite nasty. 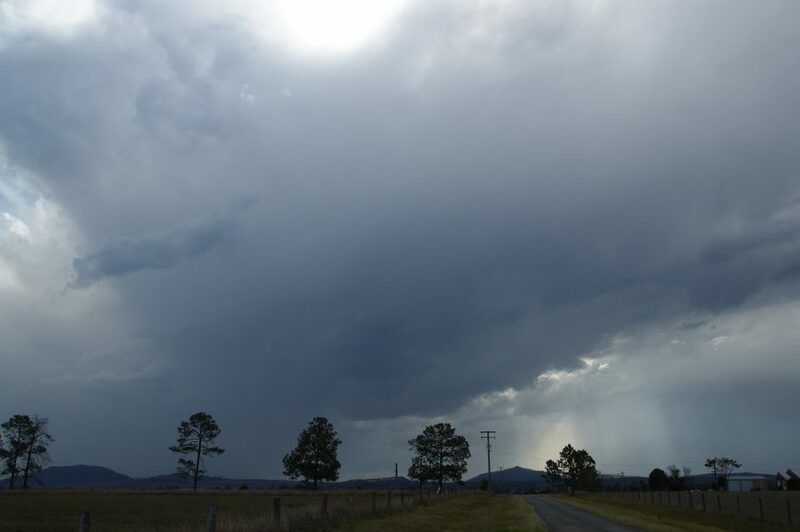 The Bureau of Meteorology warns that, at 5:15 pm, severe thunderstorms were detected on weather radar near Crohamhurst and Maleny. They are forecast to affect Mapleton and the area northwest of Mapleton by 5:45 pm and Kenilworth and Pomona by 6:15 pm. I haven't looked into this in much detail but I think these storms are very interesting. I guess not too many people paid much attention today due to the low forecast CAPE (including myself). 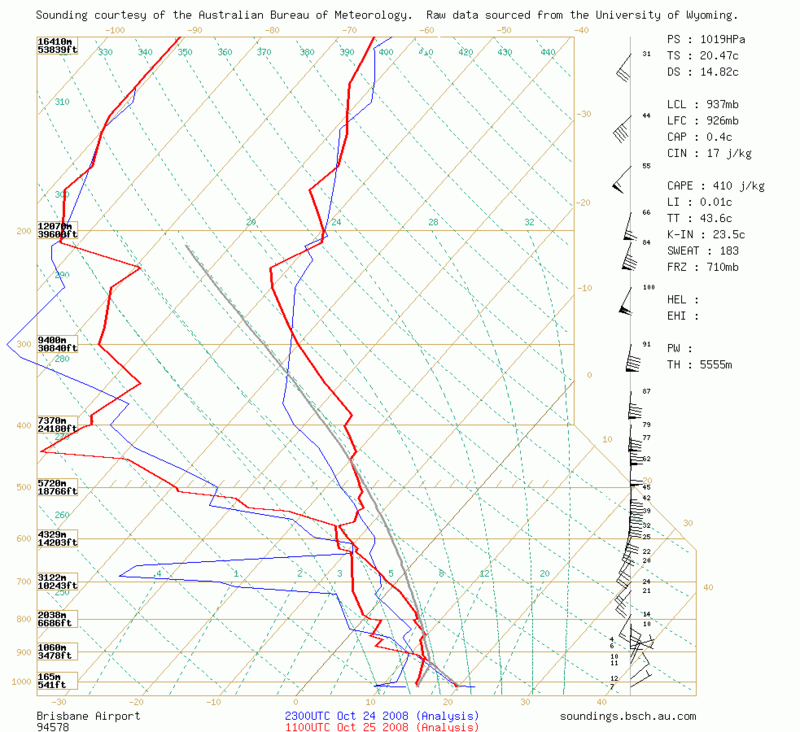 Replotting a forecast sounding in the general area for 23/14 gives only about 750 j/kg of CAPE and an LI of -3 with the EL sitting a little over 7000m. Despite this lack of CAPE the storms were actually quite strong with sustained black cores. In fact, I think these storms were low-topped supercells. 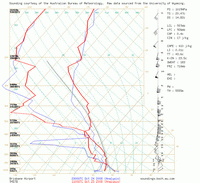 It seems deep NE flow (surface to 900 mbar) with moderate to strong mid and upper level flow were contributing factors. Another major point is that this area was in the right exist region of a strong 100 knot upper level jet. This may have provided strong background ascent to aid updraft strength. 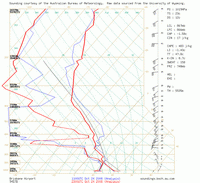 I must admit to not even looking at figures ot wind diagrams for Queensland as to what might develop. However the storms that did develop were long lasting and covered quite a distance. And yes, had a very solid black core on the radar for quite a period. 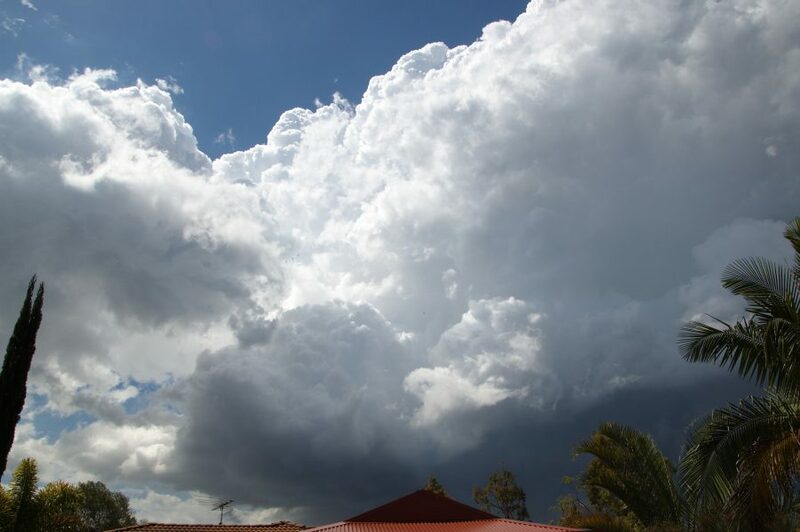 Channel 9 news Brisbane (watchable live online, though not very well with my crappy internet connection) did during the weather describe them as supercells. The loop certainly looked very strong though they didn't show up that well on the bsch satellite photos, except the last one was still well lit when half the state was in darkness. After attending the ASWA meeting on the south side of Brisbane, some shopping and a confirmation of plans for Saturday night (saw Little Red up at Coolum...AWESOME), me and the g/f headed up to the sunny coast with her dog for the night. On the way, I was watching this cell over to the NW build nicely and saw that it'd be raining if we went to the beach so we decided to go chasing instead (great for me!). It was her first chase (and the dog's first too). 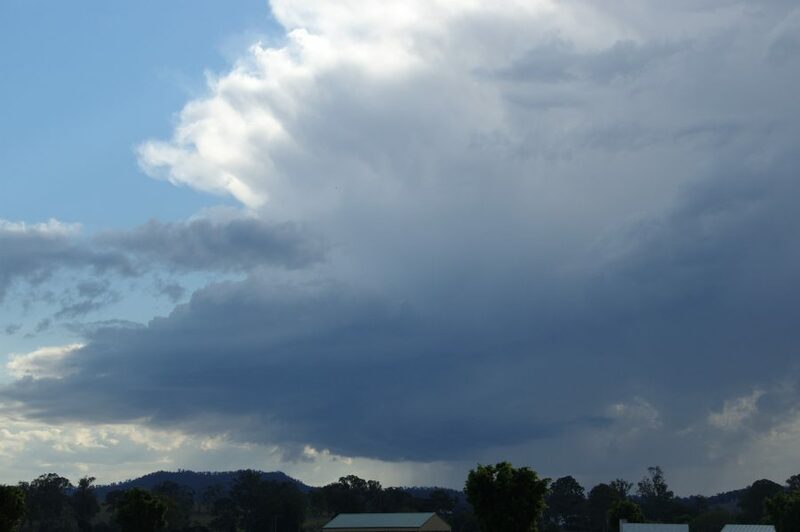 We cruised out to Landsborough and then west to Peachester and then further west again as it was clear this storm was moving NNW as opposed to N or NNE. 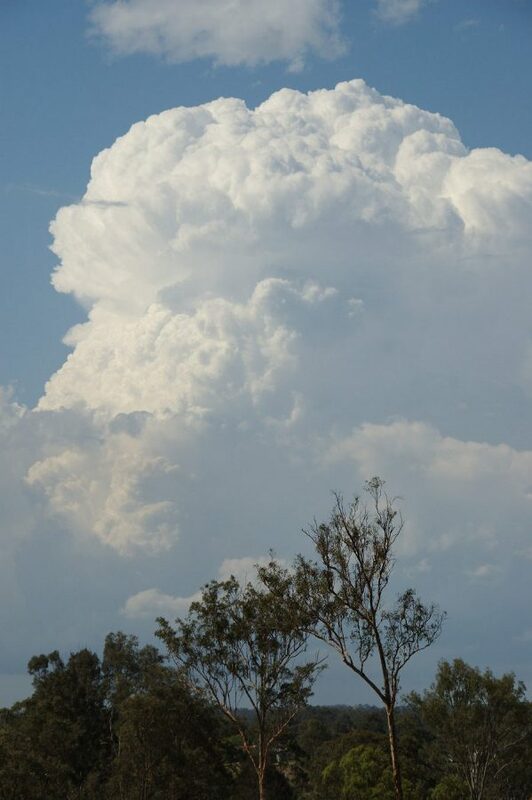 It had some great structure when we first saw it with a nice inflow band, etc. It pulsed while we positioned further west to intercept and as it neared us, it intenified (visually) rapidly just to our S. A really nice RFD came down and there was some half decent base rotation for a while. We didn't have much of a choice but to sit it out as there were no road choices with a view and we had a nice view from where we were. The RFD basically wrapped around us - we were sitting in clear, rain free area (literally under the wall cloud) and there was precip to our south around to the north west and also from the south around to the north east. Anyways - given what i'd seen earlier when checking the models, hail was a given and sure enough...thump...thump....thump....then popcorn like hail from 1 to 4cm fell for about 10 minutes. The dog went slightly nuts but was pretty much ok after the first 2 minutes (and was more than happy to munch on the hail afterwards). We drove back along the Peachester Rd towards Peachester and there was some hefty hail drifts with the road sporting a nice 4-5cm deep cover in places with just the black tyre tracks showing through. The hail swathe stopped just west of Peachester (matches radar pretty well) and that was pretty much it. The hail was interesting - it was quite jagged - one piece in particular was about 6cm long and about 1.5cm round and jagged at one end and tapered down to almost a point. No dents for the car (lucky - it was hers). All in all not a bad day for a "fine", then "afternoon shower", then "afternoon thundery shower" forecast. Pics to come in a day or two (maybe tonight) from yesterday and also Tuesday down in the NR's. I was also at the Brisbane ASWA meeting with Rodney and Jason (and my son David) and it was obvious hailstorms were very likely. 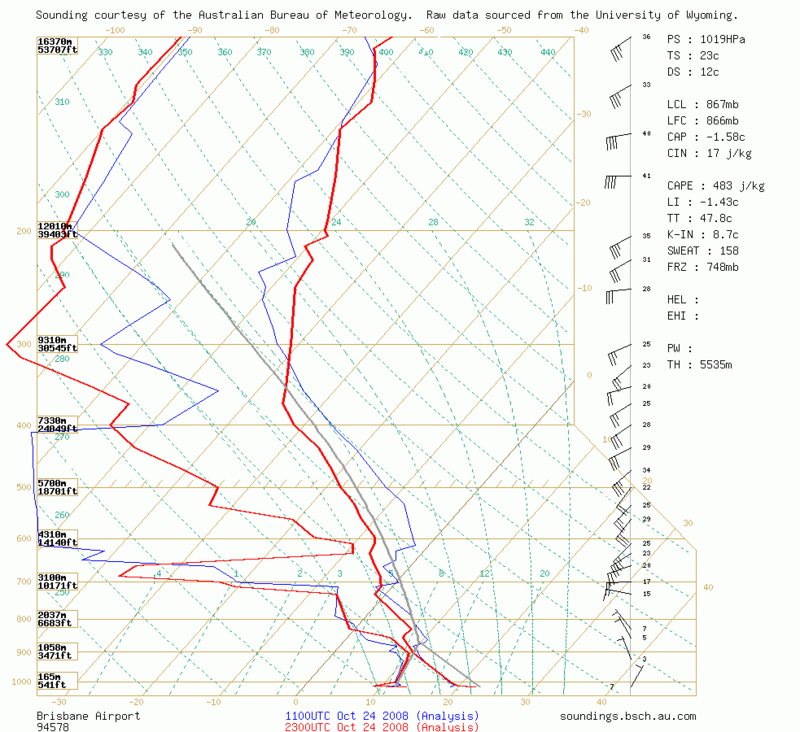 GFS was pretty good in its forecast of warming upper temps later but increasing southerly shear - see the soundings below. The main line of storms which continued on into the evening pretty much developed right over the top of AC's house (near Greenbank on radar). 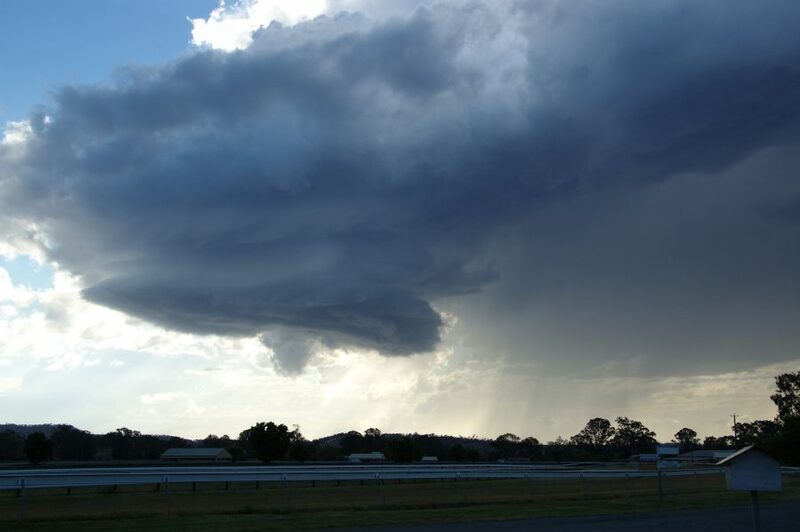 We were not able to head north after the meeting finished, so moved to Beaudesert and watched some other storms there. 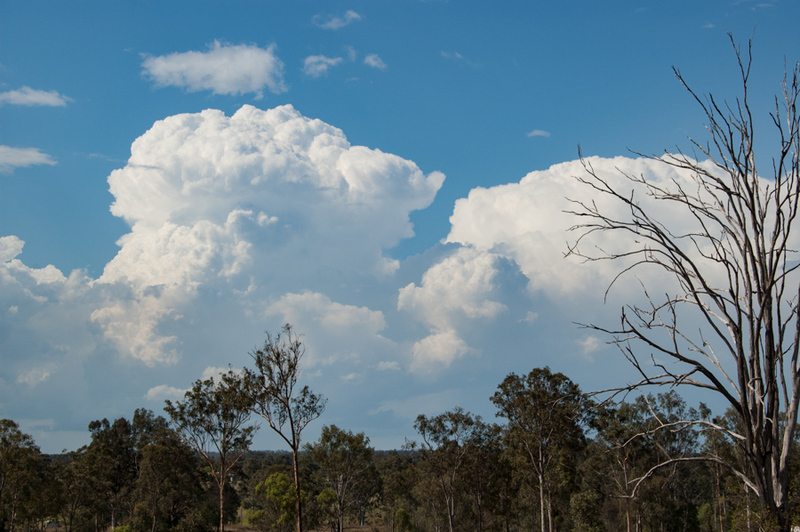 Second link is to the images from Saturday's supercell in the Sunshine Coast Hinterland which dumped 4cm hail on me west of Peachester. Very nice storm with some large translucent hailstones there. No dents on the car? That's hard to believe or is that the story you told your girlfriend haha:) Look closely.